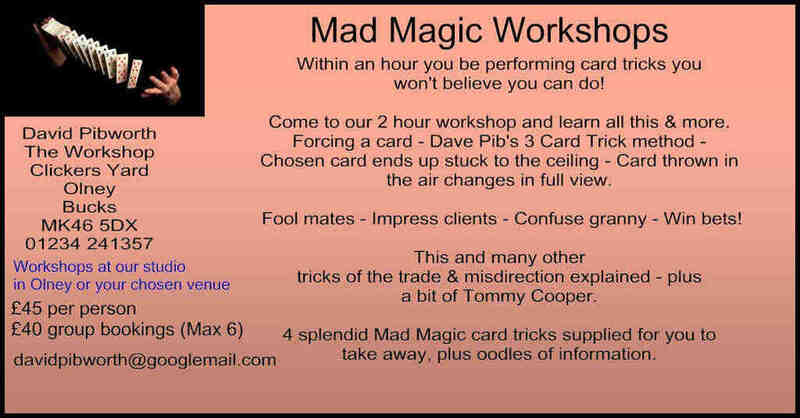 My Mad Magic Workshops teach a range of simple tricks anyone can master. What I've realised over the years, is that the easy ones are the best, certainly for those new to magic. When I say easy, what I really mean are that they are simple to operate. I don't tend to do any of those card counting tricks as they take so long and at the end are only mathematics, which certainly has it's place, but aren't really the sort of thing to wow people immediately. "What you need to do is to appear to do a bit of magic off the cuff with little or no setup." There will always be a little bit of setup of course, but really, the best ones are when you just dip into your pocket and pull out a pack of cards and get a person to pick a card and the one they pick has their name on it ... and yes I can teach you that in a matter of minutes! Also making things disappear is another winner. I must be the most popular dad in my daughter's playground, as I'm always happy to play to an audience and the youngsters come rushing up and say "Hey, can you make a hanky disappear today?" and yep, I always carry around stuff in my pocket. And those are the gags that just make you more interesting and to be honest are really don't cost much money. Should you want to do something more extreme, such as make an elephant vanish, the setup is longer and more logistical. It's getting the elephant that tends to be the trickiest bit, especially an elephant that will listen to what you want him to do. "I'd stick to my stuff to begin with." Quite a bit of it is pure confidence, and the way I teach you little bits of misdirection and such like, just gives you more insight and ultimately confidence. I'm off to Blackpool for the Magic Convention this month, which is pretty spectacular, and of course we sit in the hotels at night swapping nuggets of information, but ultimately I'm there to socialise and keep my eye on any large stage illusions that may come in handy for productions that I'm asked to help with. But I always pick up a few tips that are handy for the day to day magic. So there you are. You know where I am and I'm here to help you as I can assure you that doing a bit of magic does make people take notice of you.